6-foot (1.8m) single-leg retractable web and snap hook at one end, web loop choker at other end. 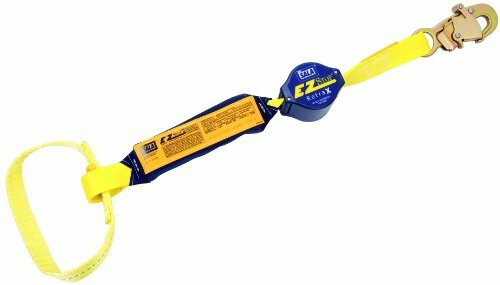 The EZ-Stop Retread is the first shock absorbing lanyard that retracts automatically to fit the working area. It is a unique alternative to elasticized lanyards and uses a retraction technology similar to airport security lines. These devices retract and expand smoothly and consistently from 2-1/2 to 6-feet (0.8 to 1.8m). The retraction keeps the lanyard taut and close to the body at all times, reducing trip fall hazards, snagging on equipment and dragging. The EZ-Stop Retread incorporates our popular shock type pack, tough polyester webbing and a polycarbonate thermoplastic retractor case. They feature a controlled tearing action when subjected to a fall, reducing the forces imposed on the user to safe levels and stopping the fall. Our patented self locking snap hooks which are widely recognized in the industry for their user friendly operation and are preferred by safety professionals and workers alike. Specifically designed to allow you to open and connect the hook without getting your thumb or fingers in the way, even with gloves on. About Capital Safety, the world's leading designer and manufacturer of height safety and fall protection equipment with 20 operating sites worldwide, is home of the DBI-SALA and PROTECTA brands. All of Capital Safety's fall protection and rescue systems are backed by extensive training, knowledgeable technical assistance and professional customer service.